Washington, D.C., Mar 28, 2011/ – The spirit of spring is in the air at Macy’s Metro Center where, for the first time ever, live cherry blossom trees will take center stage at the Macy’s Cherry Blossom Show. From Sunday, March 27th through Sunday, April 10th, the Main Floor of Macy’s Metro Center will celebrate the era of renewal as it is transformed from a vibrant retail landscape to an unexpected floral wonderland complete with live blooming cherry trees. Visitors from across the country and around the globe will have the unique opportunity to enjoy this traditional sign of spring in the heart of our nation’s capital, regardless of the weather conditions outside. This whimsical floral fantasy highlights the celebrated trees in partnership with the National Cherry Blossom Festival. Thirty cherry trees each week, ranging between 12 and 18 feet tall, will welcome both shoppers and arborists alike, elegantly guiding them along the main aisles of Macy’s Metro Center. At the culmination of the two week long celebration, sixty trees will be donated to the National Park Service, including forty Okame trees with pink flowering blossoms, and twenty Snowgoose trees with white blossoms. The Macy’s Cherry Blossom Show will also serve as a spectacular backdrop for two weeks of in-store special events, including fashion presentations, cooking demonstrations and musical and dance performances that will enchant floral fanatics while celebrating the rejuvenating power of the season. Free to the public, Macy’s Cherry Blossom Show will be open during regular store hours. For additional information about these events contact the Macy’s Flower Show Hotline at (212) 494-4495, or visit www.macys.com/flowershow. Macy’s Cherry Blossom Festival is presented in conjunction with the National Cherry Blossom Festival. 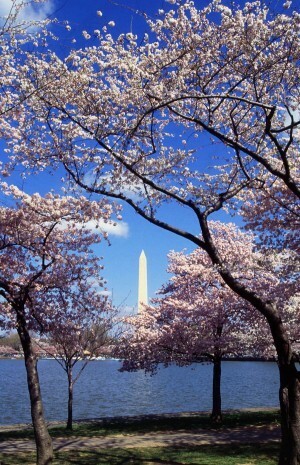 The National Cherry Blossom Festival is Washington, DC’s and the nation’s greatest springtime celebration. The 2011 Festival, March 26-April 10, includes three spectacular weekends and daily events featuring diverse and creative programming promoting traditional and contemporary arts and culture, natural beauty, and community spirit. The 2011 Festival commemorates the 99th anniversary of the gift of the cherry blossom trees and the enduring friendship between the United States and Japan. Hotline: (877) 44-BLOOM or visit www.nationalcherryblossomfestival.org .